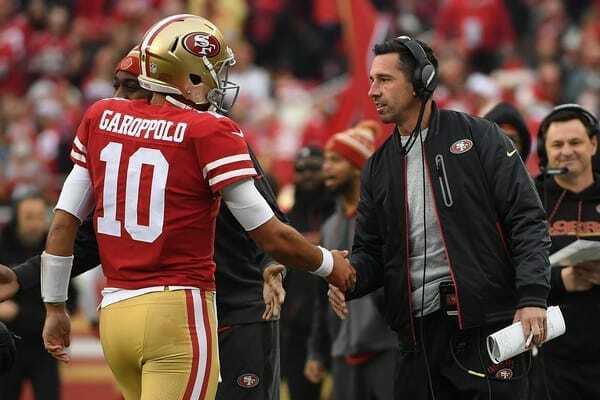 The San Francisco 49ers are looking to Jimmy Garoppolo to be their quarterback of the future. They expect him to be the answer to their woes. To take the team back to their glory days. You know, the days when the stadium was packed with fans in awe of the great Joe Montana. And even after he left town to join the Chiefs, there was hope in the form of Steve Young. These two legendary quarterbacks were the staple of the 49ers organization spanning nearly two decades. Between them, they had brought the city of San Francisco five total Lombardi Trophies. But since Young’s retirement in 1999, the 49ers have not been able to win the big game. Yes, they’ve had some very capable signal callers, including an underrated Jeff Garcia and Alex Smith. And then, there was the Colin Kaepernick experiment, which ended poorly for everyone involved. 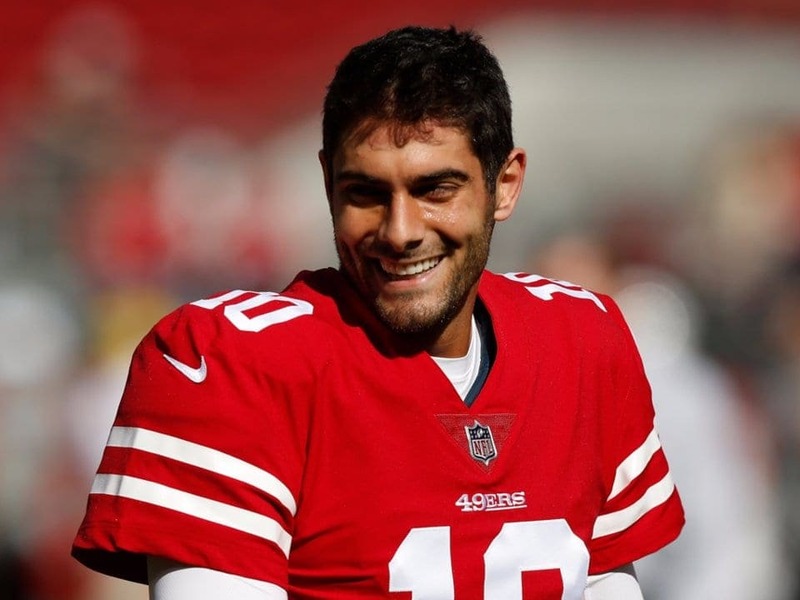 Now, heading into the 2018 season, there appears to be incredible hype surrounding their newest quarterback – Jimmy Garoppolo. To his benefit, Jimmy G came in last season and took over an 0-9 football team. He immediately infused confidence into the offense, and even the defense began to play better than they truly were on paper. The team’s response was to put together five consecutive victories to close the season. But the hype that has ensued following these wins has reached levels that no longer make sense. Are these W’s being taken out of context? A closer look reveals the truth. In his first start, Garoppolo didn’t even throw a touchdown pass against a relatively weak Bears defense. 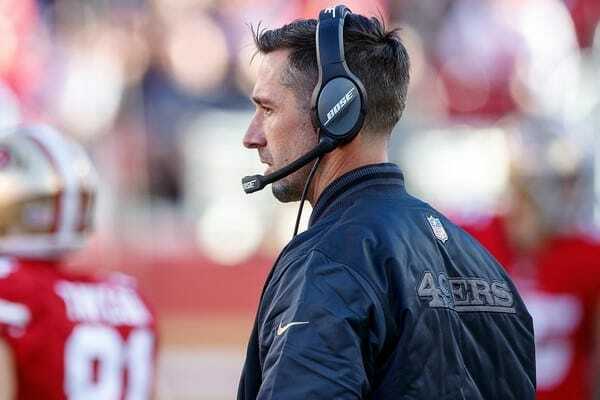 San Francisco was able to squeak out a 15-14 victory against a squad that finished 2017 at 5-11. The next game was a more impressive offensive performance against Houston. But again, there could be an asterisk next to this achievement, as the Texans were short-handed, missing J.J. Watt, Deshaun Watson, and Whitney Mercilus. So while a win in the NFL is still a win, it’s important to see the full picture. Among their remaining three wins with Jimmy G as the starter, the 49ers were able to defeat the Rams, who at that point in the season had nothing to play for. Most of their most prominent starters didn’t even play in the game, yet Garoppolo still threw two interceptions in that game. All of these factors are not an indication that he didn’t impress. Only that he hasn’t proven himself to the point where the hype matches his on-field play. Then there is the matter of the defense, which was rather putrid last season. They allowed the 26th most points in the league just last season. As previously mentioned, the result was an 0-9 start to the year. While it’s sometimes possible to mask defensive deficiencies in the short-term, it’s much more difficult to do so over the course of a full NFL season. Not to mention the playoffs, when some of the strongest offenses are often an obstacle to the big game. How would this defense fare against the likes of a healthy Aaron Rodgers, a loaded New Orleans squad, or any of the other NFC powerhouses? I’ll let you be the judge of that. Looking at Jimmy G, it’s also important to consider that teams have now had a full offseason to study his game film and adequately prepare to stop him. NFL coaches are very smart, and they will find his weaknesses and attempt to exploit them. It’s not rare to see young players have early-career success, only to find the going much tougher once teams are able to game-plan for them. They study their tendencies, and any deficiencies will be evident on film. The question is, how will Garoppolo respond? Another factor that cannot be understated is the fact that Garoppolo will be facing much more pressure this season. Not only from defensive front, but from fans and the media. Jimmy G is the third-highest player in the NFL, after signing a five-year, $137.5 million contract earlier this offseason. The guy has barely started a total of seven games, and he will now have to step in to prove that he is worth the money he received. That is not as easy as playing when nobody truly has any expectations from you. But with the 49ers breaking the bank to make him their quarterback of the future, anything less than a dramatic improvement (let alone an eventual Super Bowl) will be a major disappointment. With so many factors to overcome, Garoppolo will be facing an uphill battle in his first full season as a starter. His schedule in 2018 will not exactly help him out. He plays in the NFC West, where the Rams have made many improvements this offseason. They had transformed their secondary by signing both Marcus Peters and Aqib Talib, and they already have a formidable pass rush. You can bet on new Defensive Coordinator Wade Phillips scheming to stop Jimmy G when these division rivals face off next season. And while the Seahawks seem less threatening than ever, leave it to Pete Carroll and Russell Wilson to still put up a fight no matter what. Those two regular season matchups will not be easy for SF. Their schedule also dictates that they face the NFC North this season, including two tough road games at Green Bay and at Minnesota. They also play the AFC West, which boasts arguably the best group of pass rushers in the NFL. Denver has a lethal combination of Von Miller, recently drafted Bradley Chubb, Shane Ray, and Derek Wolfe. The Chargers, who fielded one of the best defenses in the entire league last season, bring back a strong unit that includes pass rushers Joey Bosa and Melvin Ingram, as well as a stingy secondary led by Casey Hayward and Jason Verrett. Football is the ultimate team sports. And while a great quarterback always gives any team a chance to compete, more often than not, it won’t be enough to win a title. Logic suggests this team is still a year or two away from truly becoming a Super Bowl contender. Can someone please put the breaks on this out-of-control hype train?